Return now to dying Mars in its last age of glory. A planet of flashing swords and choking sands, of winking courtesans and lantern-lit canal cities. Mars, where fortune and death are two sides of the same obsidian chit, where lost cities and dry oceans stretch between the last bastions of civilization. Where the First Martians, the monument-builders, are but a haunted memory. Where the Red Martians become decadent and reckless in their last days. Where the Pale Martians rule the wastes, remembering a history whose weight would crush a lesser people. If this sounds interesting to you, head over to our DriveThruRPG storefront to get the Cavaliers of Mars Jumpstart. Full rulebook coming soon! Cavaliers merchandise is available via our RedBubble store. 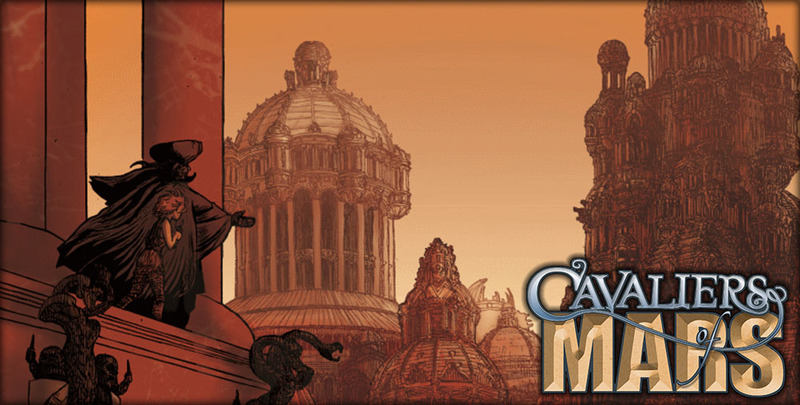 Now Available: Cavaliers of Mars Jumpstart and Gen Con posters!